Americas Best Value Inn-AT and T Center offers the most value for your money when staying for business- pleasure- or just passing through. We offer clean spacious rooms- free coffee in lobby- free continental breakfast- and Wi-Fi throughout the hotel. All guest rooms include microwaves- mini-fridges- coffeemakers- hairdryers- iron- ironing boards- 32 inch flat panel cable TV- HBO- and ESPN. We also have an outdoor pool- open from May to September. Take advantage of our extremely comfortable beds and relax while saving money year-round with our Kids Stay Free Policy *11 and under in parent*s room*. For those guests that are in town on longer term corporate assignments or business trips we also offer special weekly and monthly rates- as well as direct billing options. For your convenience our hotel offers both smoking and non-smoking rooms. Sorry- no pets allowed. We are conveniently located near to downtown San Antonio- the Alamo- the San Antonio River Walk- and San Antonio International Airport. We are located off of Interstate 35 at exit 160. Americas Best Value Inn-AT and T Center is your best choice within the *Alamo City. * We offer ideal accommodations and location whether you are in town for sporting events- sightseeing- shopping- or simply passing through on your way to Austin. At Americas Best Value Inn-AT and T Center our goal is to provide our guests a great experience- not just a place to stay. At Americas Best Value Inn-AT and T Center- We*ve Got You Covered from the time you hit the road until your head hits the pillow. 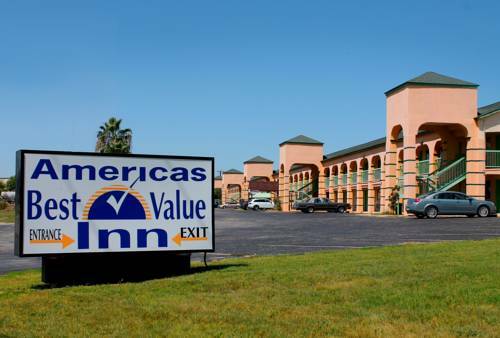 Welcome to Americas Best Value Inn-AT and T Center- located near downtown San Antonio- the Alamo- the San Antonio River Walk- and San Antonio International Airport. We are conveniently located just off I-35 at exits 160. Our address is 3645 North PanAm Expressway- San Antonio- TX 78219.